While I’ve blogged about the difficulty we sometimes face in finding modest, age-appropriate clothing for our daughters, I still enjoy shopping for cute clothes for our girls. Gone, however, are the days of my choosing outfits and bringing them home to be worn. Now they usually shop with me to ensure that the clothing fits properly and that they like the item enough to actually wear it. We occasionally do some online shopping together, too. I am not into brand names just for the brand name’s sake. However, if the quality of the clothing means that both girls can wear an item over the span of a couple of years, I am typically willing to pay more for those pieces. These are my favorite spring/summer outfits in their closet. 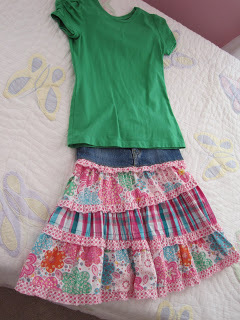 Both top and skirt are from The Children’s Place. I have found the quality of their clothes to be excellent over the years. The basic, cute, and comfortable dress from Lands End. As to quality, it doesn’t get much better than Mini Boden. 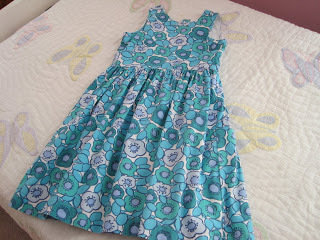 My ten-year-old wore this dress for two years; it’s now on my eight-year-old’s side of the closet and still looks fabulous. She often wears it with a short-sleeved white sweater. This is another favorite skirt from The Children’s Place. I bought the same skirt a couple of years ago for my older daughter, who has since passed it down to her sister. I liked it so much that I found it in a larger size on eBay and bought it once again for my older daughter. The shirt is from Belk department store. 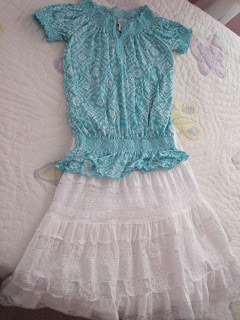 Here’s a Mini Boden skirt and a shirt from The Children’s Place. I am blessed with a friend whose daughter is older than my girls and she shares outgrown clothing with us. The shirt originally belonged to her. Are there outfits in your daughter’s closet that are favorites? Where do you like to shop for your girls? Good morning 🙂 I've never heard of mini Boden. I'll have to check that out! Right now, I like Gymboree, Carters, and Heartstrings. We are fortunate to live near 2 outlet centers, which allows me to shop inexpensively. I alos like Janie & Jack – but the brand is very expensive. There is a local consignment store that carried the brand, which is nice! The quality is amazing. I am touch and go on Children's Place. This season I haven't found much that I love – but last year I did! That blue bodin dress is just so cute! As the mother of 4 daughters I really enjoyed this post! I'm with you on the namebrands – sometimes they're better and sometimes not. We have a few favorites we watch for at Thrift stores. We've also found that the clothes from Target hold up fairly well, although not necessarily for longer than a year or two. We get good basic solid color t-shirts, tights, and that sort of thing there. I like many of Gymboree's styles – and the quality as well – but over the years, their clothing hasn't fit my girls very well. Once in awhile, though, we seem to hit the sizing right, although my oldest will be outgrowing Gymboree soon. Like you, we have an outlet center nearby and I find their prices to be much more reasonable than the mall store. When buying from Mini Boden, I always wait for a coupon code that comes with free shipping. They send those out pretty regularly; otherwise, their prices are pretty steep. Yes, I like to pick up basic clothing pieces at Target as well. When my girls were younger, we also bought sandals and tennis shoes there quite often. My sister has two older daughters so I get a lot of "seconds". And she has great taste! She also buys quality to ensure both of her girls get use out of their wardrobe. I buy new from Children's Place at the end of seasons. Their prices can't be beat! I usually pay between 2.99 – 3.99 for a top, dress, pants, or even shoes. I put the clothes away and save them for the following year. I also buy from Target and Old Navy. They have great sales but you have to keep looking to find the best deals. Modesty is my number one when choosing clothes for Jane!!! 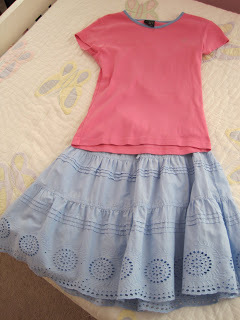 Love that I can find sweet, feminine, and modest clothes at Children's Place and Target. I hope that doesn't change. Modesty is key for us as well – and knowing in which stores modest clothing is more likely to be found helps make our shopping trips at least a bit smoother. It really is a blessing to have clothes passed down from friends, so I try to do the same for others. I have to look outside the family, however, as I only have nephews on my side of the family! Those are some pretty outfits. There is a wonderful consignment sale that occurs in our area twice a year. 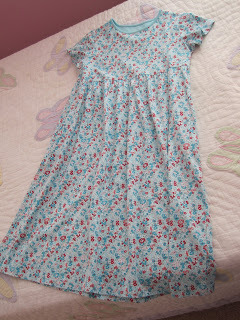 I usually buy most, if not all, of my children's clothes for the next season there. Sometimes, it's hard finding things for my oldest daughter, but this year there was plenty. I supplement the sale wit things that I find, well, at all kinds of places. I did buy several Land's End dresses, and I'm very happy with them. Those outfits are sooo lovely!!!! I usually get hand me down (having 6 sister in law younger then me and all hehe) but when I shop it's always second hand 🙂 but am planning to start sewing a few things for them!